Donna Towle, Colonial Daughters Chapter DAR member, and Ethan Couture receiving his Good Citizen Award. 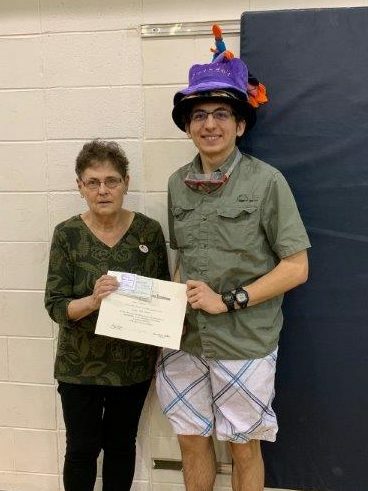 DIXFIELD - Ethan Couture, a senior at Dirigo High School in Dixfield was recently presented the Daughters of the American Revolution 2019 Good Citizen Award. 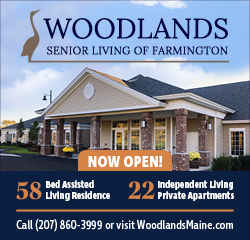 Donna Towle, a member of the Colonial Daughters Chapter of DAR in Farmington presented the award. Ethan received a Good Citizen pin, a monetary scholarship and a certificate authorized and signed by the National Society’s President Anne Turner Dillion and Maine State Society’s Regent Elizabeth Blake Hotchkiss. Couture is the son of Earle and Julie Couture of Dixfield. Couture’s efforts and accomplishments during his high school years have been outstanding. He is a member of the National Honor Society and Student Council. He has received many sports awards in cross country running, Nordic skiing, and track & field, 2 MVPs, and 2 Rookies of the year. Science is a valued area of interest, he attended High School Paleontology Camp for 5 years. Couture volunteers at Dirigo Elementary School, during which time he wears “many hats”, much appreciated by the children. He enjoys helping others succeed in academics or extracurricular activities. In Couture’s future are college for 4 years, then grad school in a field of paleontology, the final goal is a PHD. The Colonial Daughters sponsors six area schools to recognize excellence in high school seniors. Each school’s faculty nominates several candidates for this honor each year. The person chosen to receive the honor must have demonstrated each of the qualities as defined by the National Society of Daughters of the American to an outstanding degree. These qualities are dependability (truthfulness, loyalty and punctuality): service (cooperation, courtesy, and consideration of others): leadership (personality, self-control and ability to assume responsibility): patriotism (unselfish interest in family, school, community and union). Couture demonstrated these qualities during his years at Dirigo High School. The National Society Daughters of the American Revolution was founded in 1890 to promote patriotism, preserve American history and support better education for our nation’s children. Its members are descended from the patriots who won American independence during the Revolutionary War. With more than 165,000 members in approximately 3,000 chapters worldwide, DAR is one of the world’s largest and most active service organizations. To learn more about today’s DAR visit: www.DAR.org.